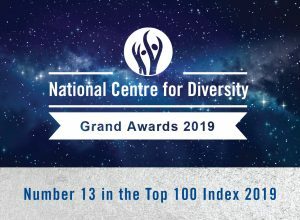 The National Centre for Diversity (NCFD) have announced their UK’S TOP 100 companies that make a difference in the workplace and set the bar high for fairness. We are proud to announce Release Potential Ltd came 13th overall out of 100, moving up 20 places from 2018. The annual index covers the UK’s private, public and third sectors. Release Potential Ltd have worked hard over the last year, winning ‘UK Small to Medium business 2018’ at the National Centre of Diversity awards. Well done to all that were involved!